Chuck is a very gifted photographer whose interest varies from grungy abandoned buildings to beautiful rolling landscapes and from colorful HDR images to moody black and whites. But it is his love of landscapes and nature photography that he most desires. There was never a defining moment when Chuck decided that he wanted to be a photographer. He never considered himself to be an artistic person, but there had always been an underlying desire to create. From a young age, he remembers admiring photography and art but didn’t take this interest any further until later in life. As a young boy, he traveled frequently with his family throughout the United States, and it was on those cross country trips that he first began taking pictures with his point and shoot camera to document the places he had visited. That is where he first developed an appreciation of the beauty of landscape photography. After a college art class and then buying his first DSLR camera, he threw himself into photography almost to the point of obsession. Being self-taught, he soaked in everything he could about photography mostly by reading books, watching webinars, studying the works of others and going out to shoot as much as he could. He had finally found the creative outlet that he so desired. With the use of his camera and some software, he is finally able to create his own visual art. He does not want to merely photograph what is seen but how an image is seen by him. * "Excellence Award Winner" in the Black & White Magazine February, 2018 issue. * Shown at the "Extraordinary Frames of Reference" at Baltimore-Washington International (BWI) airport's inaugural exhibition in the new gallery space between D and E.
* Featured on the album cover of local Baltimore Hip Hop artist, Poet Deep. * "Spotlight Award Winner" in the Black & White Magazine October, 2015 issue. * Featured HDR Photographer on Photofocus.com. To view the article, please click here. * Featured artist for the Maritime Magic 2013 gala event benefiting disadvantaged youth in Baltimore served by Living Classrooms programs. A collection of my Baltimore images will be on display at the Frederick Douglass-Isaac Myers Maritime Park for the month of September, 2013. * An image has been selected for the 125th anniversary of the Rawlings Conservatory in Baltimore to be displayed on street pole banners, a history display and their new visitor guide. * Several of the Abandoned Baltimore images were selected for the State of Maryland Public Defenders website in 2012. * Images have been published in the 2011 COLOR Magazine portfolio contest in which I received an "Excellence Award". * Two images have been selected as part of the 2011 HIV Awareness campaign in Baltimore, MD. 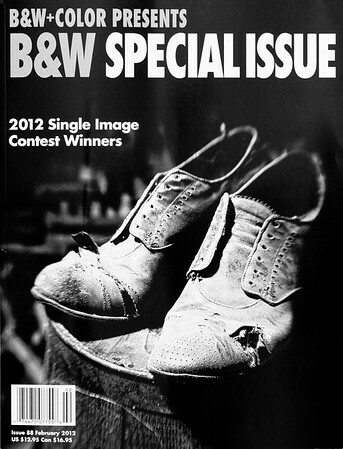 I am pleased to announce that my image of "Shoes" was chosen for the front cover of the February 2012 issue of B&W Magazine.